My writing spaces have progressed along with my writing career. My first spot was a desk in the corner of the living room. My printer was behind the chair and the cord to the phone ran up the wall and was tacked along the ceiling, through the dining room and over to the phone jack in the kitchen. Then I went the laptop route, with the phone cord laying across the living room floor through dining… you get the picture. It got tripped on a lot. Once I sold my book, we realized I needed to take my career to the next level. Since we had no room available for an office I did the next best thing— I preempted the dining room. Out went the old table that my children had colored all over. Out went the chairs—they needed a new paint job anyway. And with two busy teens, family dinners had become a thing of the past. 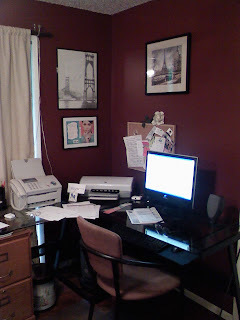 Not huge, but my printer and fax machine are within arm’s reach and I now have wireless for my laptop. Welcome to the new era! If you look closely, you can see the cover flat of my debut book, Read My Lips. (Out in stores Tuesday!) My husband had it professionally mounted and framed for me. To that end, check out the trailer for my debut book! Your office looks very organized and professional. How sweet of your DH to have your cover flat framed. I’m running out to buy your book ASAP. Wow, awesome book video, Teri! And the books sounds pretty fabulous, too. What an original concept.